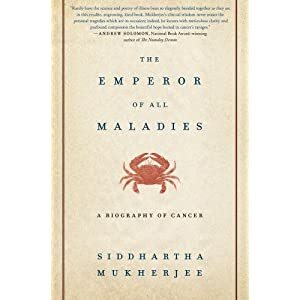 Brian’s Note: With yesterday’s announcement that Siddhartha Mukherjee’s The Emperor of All Maladies had won the Pulitzer for General Non-Fiction, I thought it might be appropriate to rerun this review from last December 5, 2010. Illness is the night-side of life, a more onerous citizenship. Everyone who is born holds dual citizenship in the kingdom of the well and in the kingdom of the sick. Although we all prefer to use only the good passport, sooner or later each of us is obliged, at least for a spell, to identify ourselves as citizens of that other place. Must be an enjoyable read The Emperor of All Maladies, A Biography of Cancer by Siddhartha Mukherjee. loved the way you wrote it. I find your review very genuine and orignal, this book is going in by “to read” list.